Events and tent rentals typically go hand in hand. On a high level, it’s as simple as dialing your local rental dealer and picking one up or having it delivered. However, there are a lot of nuances that have to be accounted for in order to find the right tent for you next event. It’s one thing to rent a tent that’s going to cover or protect your guests in the event of bad weather, but it’s an entirely new thing when you start to consider the size of the tent and everything else that must fit under it absent of the people attending your party. Sure you may be able to fit 100 people under a tent, but can you fit the same 100 people under the same size tent with tables, chairs, dance floors, catering, and everything else? 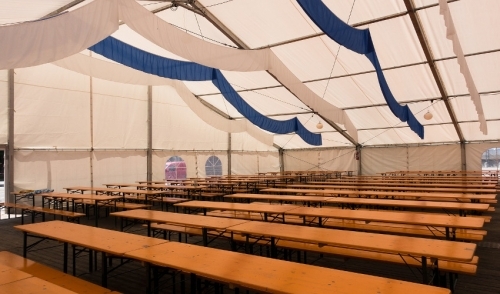 Follow this article to develop a better understanding of how big of a tent you really need for your next event. Whether you’re an event planner, an office manager, or the team mom of your kids soccer team the questions you must ask yourself before renting the right tent remain the same. With the understanding that your next event is the culmination of something truly special, start by considering the number of people you plan to fit under the tent. Keep in mind no number is too large. I’ve been to events where the tent held 20 people and others where it easily holds 200. The sky's the limit so if you’re tasked with throwing an event for 500 people, believe that it can be done. Another important factor to consider when taking numbers is the dimensions of the space in which the tent will be placed. Not only should you make sure the tent fits your guest, it must also fit the space in which it will be set up as well. This could potentially restrict the number of guests you can fit comfortably under the tent and can alter the shape of your event. Once you have a solid headcount, start thinking about the seating arrangement you will like to employ. Ask yourself will this be standing room only, ceremony, seated dining, or cocktail seating? The layout of the seating will affect the amount of space that’s available under the tent. Other components that come along with seating are the style of the tables and extras such as staging and catering. If there’s a buffet, then that will also require additional tables so that guest can move freely and grab food when prompted. It may also even require an additional smaller tent for catering staff. The number of chairs, tables, and the style of those tables and chairs will all have an impact on how big of a tent you will need for you next event. If you don’t require a stage consider yourself lucky. If you do, then go ahead and add some more space to your tent rental. Everything from the number of people to the style and theme of the event can all play a role in how big of a tent you’re going to need to coordinate a quality event that your guests will remember. Consult with your local dealer today about the options available to you and to discuss ways to organize and bring it all together under one tent. For your next event size will matter, therefore make sure to prepare and think through all of the details to make it happen.